the 33 doesn't get much love but i think it is one of their better releases and has THE best looking arcs of any model IMO. Thanks Bob, We'll get to the '33 eventually, but for now any thoughts on the 1873? What did you think when it was first released? We need Pablo T's input. 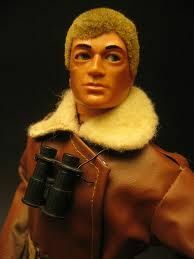 He's the only one here old enough to remember both the original Levi's model release and the 1873 LVC reissue! well to be honest while i respect what they are, to be truthful i didn't pay much attention. it's just a personal thing but my interest doesn't come online until the 1901 models and after. it's simply a practical matter as i feel i need two back pockets and prefer belt loops. i couldn't add much to the discussion until the 20's models and after. LVC denim 1873 = 1893 501 with some earlier details. The 1873 does also have a rougher look to the construction than the 1890, which looks a lot neater and with nicely finished seams. 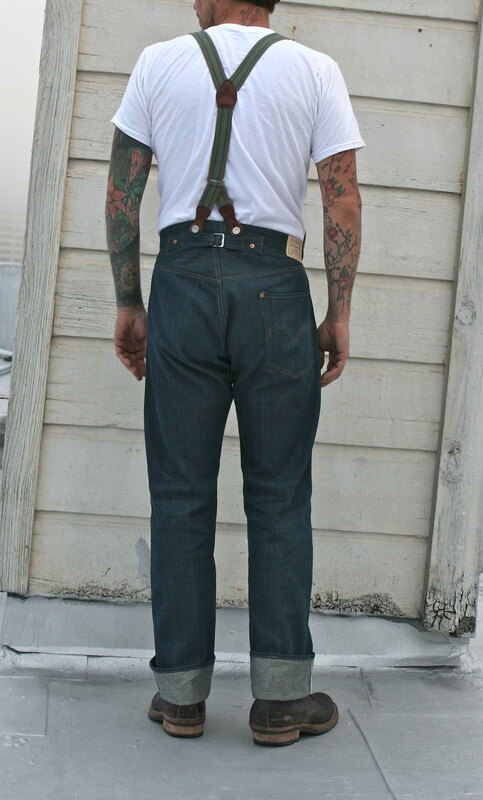 Aside from the structural details- what do you that have the natural indigo 1873 think of the denim? It is a bit on the light side, but I do like the faint green cast. The cut of these early models is really compelling to me- I love the high waist, fuller seat, and trim legs. Probably my favorite jean cut (1873-1890). I agree. I am hoping for the opportunity to try a pair out on my body type in the future. 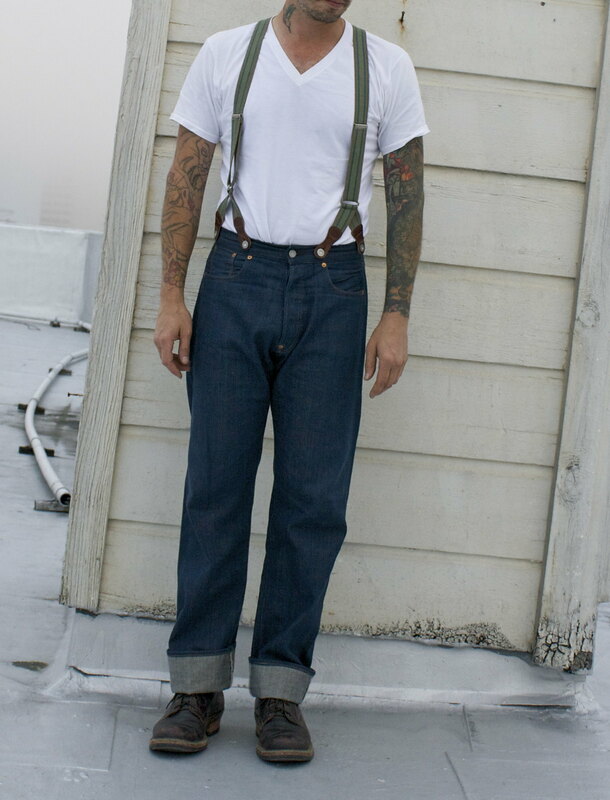 This is the Calico jean, until the Nevada jean this was apparently the oldest denim pant Levi's had in their archive. The image is from pabloTs book. Levi's dated this at about 1890. 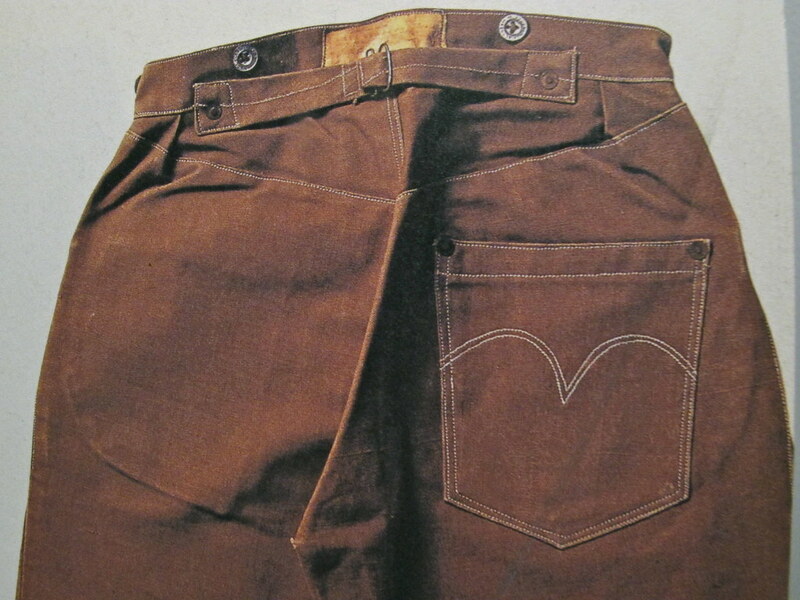 This is the boys duck pant that Levi's had in their archive at that time. (photo from BOON vintage) Levis dated this at around 1880. LVC 1873 model is based on the Calico (the oldest levi pant the designers had seen in 1998, when this was created) with details walked backward in time based on other garments (like the tag from the boys duck pant) and documentation of other details. Or so I understand it. Si or no, Sansome? I had a chance to see a close up picture of the leather label that's on these duck pants, this is the same wording label that LVC puts on all their reproduction pants that date before the two horse brand....there is a problem with this label, it says every pair guaranteed. We know now that every pair or every garment guaranteed didn't come on labels until sometime after 1891. I've brought this issue up with the good folks over at LVC and there should be some changes in the future? The 2007 LVC 1873s. The fit seems exactly the same as the 1890- I have one of each in the same size, I'll measure them and compare tomorrow. The point of this thread is to discuss how accurate the various models are, but for the 1873 that isn't really possible, as this isn't really a repro. 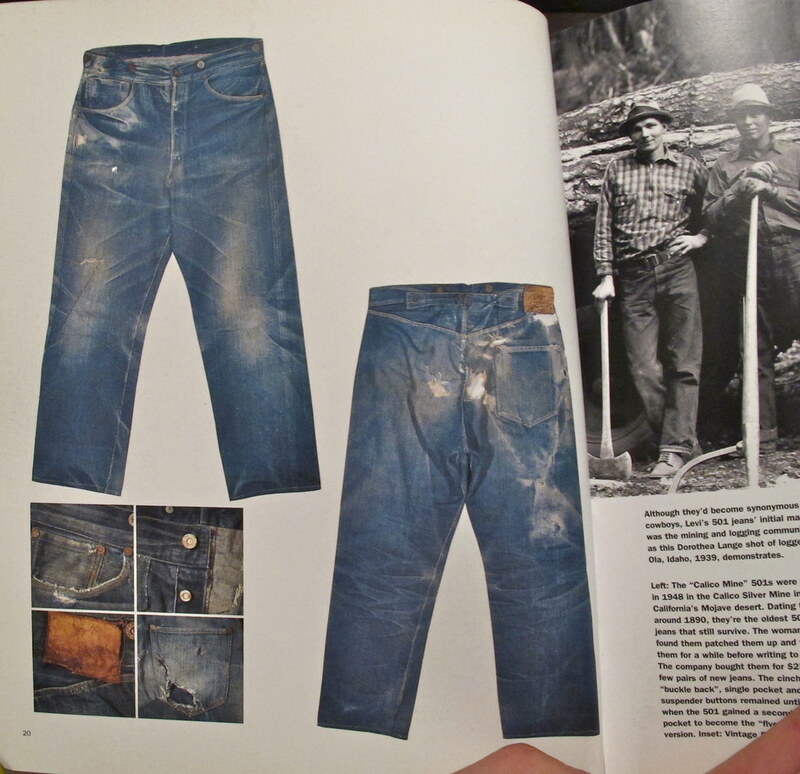 It's more of an educated guess what a 1873 Levi's denim pant might have looked like based on later models. How close might it be? Until someone documents a 1873 Levi's jean and posts really good pictures of the details, impossible to say.